Painting large dark areas in watercolour is difficult. If you go too dark there’s no turning back and if the paint goes on too dry those areas can often look lifeless. I think knowing this holds me back from painting as dark as I should sometimes. But seeing the John Singer Sargent exhibition made me realize that you can go really dark. You should see how much paint is on his paintings. It’s almost impasto in places. 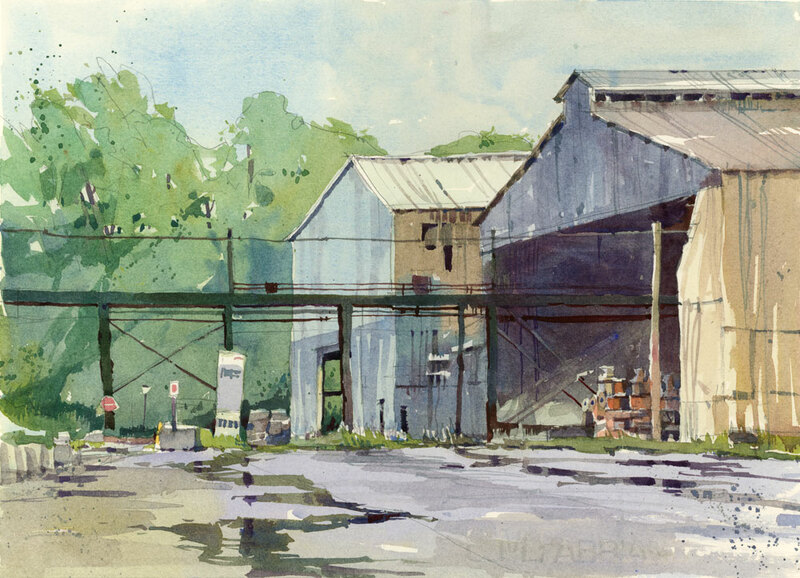 The other night on my way to downtown Montreal I drove along an industrial street that I had never seen before and made a mental note to come back one day to sketch. Despite the pouring rain and unseasonably cold temperatures I went back today and found a place to park facing these two big industrial sheds, one with a gaping hole of darkness — perfect subject to help me overcome my fear of the dark. I painted the first image, on my lap, in the car, which is no easy feat since this is on a quarter sheet of paper (15″ x 11″) so there’s no chance to step back and check how things are going. It’s always good to let the work sit awhile and then go back and have another look. When I scanned the painting I realized that the foliage at the left was too light so I wet the area and added some more darks. Re-wetting with clear water and dropping pigment into the wet areas prevents the darks from going dead. I took a picture of my car studio today because people are always asking me what the setup is. 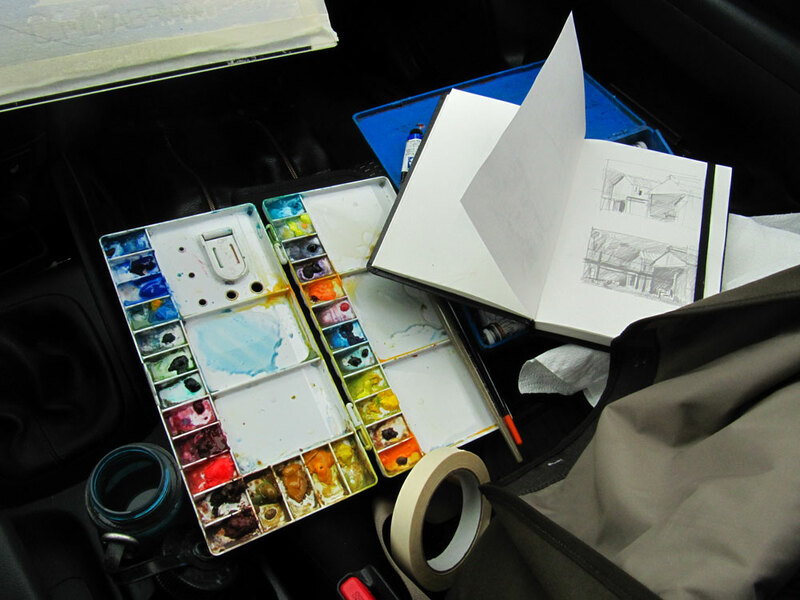 I know it’s a bit hard to see the inside of the car but my water is in a Nalgene bottle in the cup holder between the seats, my palette is on the passenger seat propped up on my brush holder, and my value sketch is next to me for easy reference. Hm, I’m going to try that tip of dropping pigment into a re-wettened spot. So, resting your board on the steering wheel… do you ever wind up honking your horn by accident?? I have never honked on the horn by accident. I realized today that I am also usually holding up the pad or the board to move the washes around so I probably don’t lean the paper on the wheel that often. We changed the venue because of the weather. We’ll be at the Museum of Fine Arts. If the rain stops we’ll paint outside but that may not happen until the afternoon. The best place to get news is on our Urban Sketchers Montreal website: http://urbansketchersmontreal.wordpress.com/ Looking forward to meeting you! Just wonderful,Shari. I especially like the water and reflections on the ground. Thanks for sharing your traveling studio with us! I also appreciated seeing the beginning washes and how you saved the whites. Thanks Linda. I was happy with the water and the reflections too. I painted this on 300 lb paper which is a luxury and a joy to work with. I am a fan of puddles too. I hope we find some in Kamouraska! Wonderful Shari. I know what you mean about the darks. I love the transclucent quality of watercolours and fear too much paint will cause opacity and deadness, but I guess it’s in the balance isn’t it? The darks really give that high contrast and vibrancy that can make a picture so attractive. Thanks Wayne. Yes, it is such a delicate balance but on this one I decided to just leap. The worse that can happen is that you end up with a bad one and paint on the other side of the sheet, which I have done many times! Glad you like it Sue! Nice painting. I like every thing about it. Thanks so much! The nice thing about working on a bigger piece of paper is that you can have large areas with no detail at all, and concentrated areas of detail. You can’t do that as well in a little sketchbook. Too many good things to say about this one to say it all economically here, so I will just mention one… the reflections. These are sooo good… wet enough to go and splash in… but when I look closely, they are just so simply crafted. Great work!!! Thanks Ross. I was happy with the way the reflections turned out. I think I could have made a painting just from the foreground. 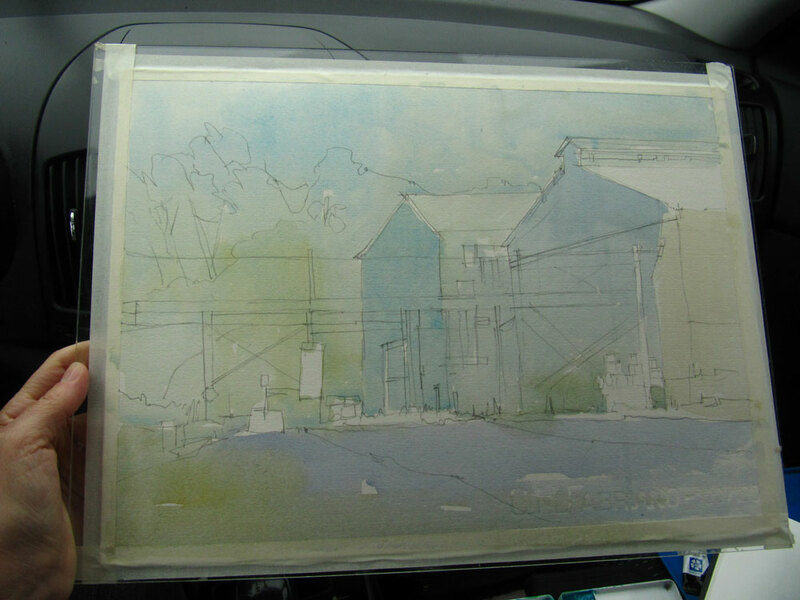 Shari, I have been receiving your sketches now for over a year and I so look forward to looking at them everyday. I have to tell you that I see a great change in skill and colouring over this time. I admire your abilities. Your daily discipline is inspiring and I have begun drawing again after a long time not drawing. I am so glad to hear that you are drawing again. Daily practice has helped me so much. I’m really happy to hear from you and appreciate that you are enjoying the posts! Shari, I can’t tell you how much I am enjoying your daily posts!! (a feat in itself!) This particular scene is SO striking, and yes, those reflections look like I would get WET if I touched them! Do you know the work of Charles E. Burchfield, a prominent American watercolorist? (and my grandfather!!) MUCH of his work is DARK, and the paintings are huge (he had to piece watercolor paper together on mounting boards.) 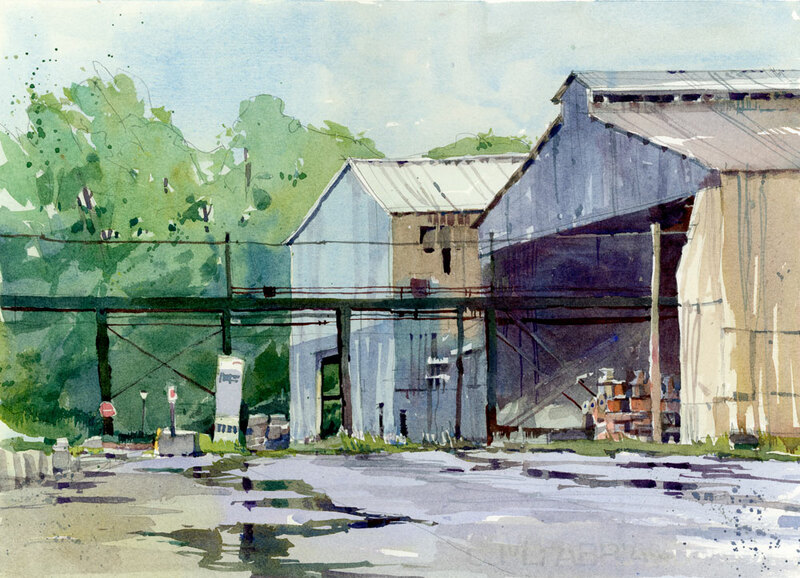 The interesting things is that he scrubs and reworks and one sees none of the clean, transparent watercolor, and yet his paintings are so incredibly alive! Check him out as you think about darks. 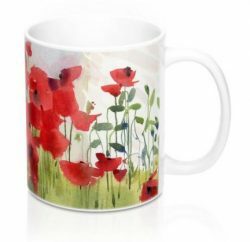 No…I only have a couple of his doodles, (and prints and wallpaper) though some of the 20 grandchildren do have some paintings. But my brothers and I grew up living only 1 mile from him, so I knew him well. I have always credited him with instilling a love of classical music, and of nature. Never watched him paint, but I was often in his studio, and while I went on my drives out into the countryside with him and my grandmother, I only recall waiting once or twice while he worked on a sketch or painting. I do own a complete set of slides of his remaining work taken upon his death, and also I have a copy of of the 10,000 pages of his unedited journal. I have often attended major art shows, including the ones at the Metropolitan (NYC) in 1984 and the Whitney in 2010. So interesting Peggy. How lucky you are to have this in your family heritage. It sounds like he left you with the wonderful gifts of music and nature. And only 10,000 pages of reading in his journal… It must have been quite impressive to see the museum shows as well. When I initially saw this sketch, I was going to inquire if it was done on an easel or lap, but the post answered it all. So much to like in this sketch, and the detail is what made me want to ask about what your work setup was like. My favorite part are the reflections in the water running down the middle of that road in front of the buildings, though what first caught my eye was the sharpness of the very angular buildings, especially the bridge structure leading into the leading building and the top of the entranceway above it. Love the process and work setup photos, too! Thanks Jason. Working on my lap was not the ideal setup but what else can you do on a rainy day when you just have to get out to paint? I have since moved out of the car and am using my easel.